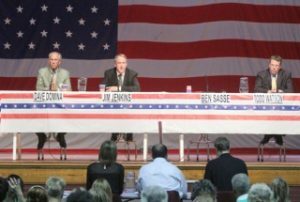 Only three of four U.S. Senate candidates attended a Sunday night debate at the Hastings Auditorium that drew about 200 people. Democrat Dave Domina and Independent candidates Jim Jenkins and Todd Watson were present, but Republican Ben Sasse was not. Sasse’s absence was noted with an empty seat at a stars-and-stripes-covered table bearing Sasse’s name. Domina then opened his remarks about the importance of “showing up.” He cited several notable political leaders who made a significant difference in government by showing up.